Last night the VMA’s aired and on top of the interesting collection of artist’s and performances including Gaga’s Italian male get-up, Joe Calderone, (she looked good as a man by the way *still love yah, Gaga*), and the adorable Britney Spears tribute including an uber talented young dance crew, who really stole the show wasn’t even born yet! 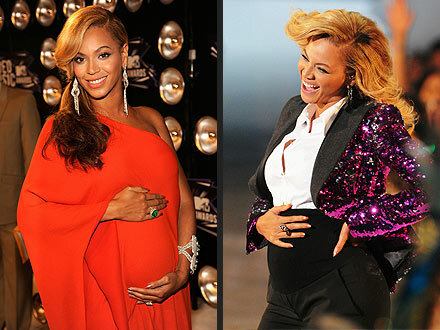 Beyoncé’s energetic performance ended with a bang when she proudly rubbed her baby bump, gleaming with happiness. But, it wasn’t just the beaming mom-to-be that was the icing to the cake. It was none other than the reaction from her hubby, Jay-Z, who was smiling from ear-to-ear. It was just adorable! The little one definitely knows how to make an impression, much like her mom! Prior to this I had no clue she was preggers. So, despite B and J denying the past rumours, it is indeed true. Baby bump watch in full effect. It’s a GIRL for Eva Mendes and Ryan Gosling! Celebrity Closet: Who is your fashion inspiration? I partially agree. In fact, a lot of artist’s got the short end of the stick during the VMA’s — never really respected this particular award show. But, I did think it was cute and I felt their immense happiness. A pregnancy is a beautiful thing so it did make me smile and as much as we hated or loved how it was done, it was still definitely one of the highlights of the VMA’s. I’m not a big fan of Beyonce and even less of a fan of the method in which she chose to announce her pregnancy. It was a night for ALL musicians and it just feels like she wanted to steal the spotlight. I did not respect that.